Asik averaged 5.8 points and 7.9 rebounds for the Rockets last season. A lesson in “loyalty” for those who may be new to the business of professional basketball: Everybody is expendable. You might remember last summer when the Houston Rockets signed free-agent superstar center Dwight Howard and the team’s incumbent center, non-superstar Omer Asik, requested a trade soon after. Asik, a Muslim brother from Turkey, saw Howard’s arrival as bad news for his own playing time, and he was right. The Rockets didn’t honor Asik’s trade request and kept him — probably asking him to be loyal and surely telling him all along that he was really, truly a big part of the franchise’s future — and Asik’s minutes predictably went down, from 30 minutes per game before Howard to 20 minutes per game with Howard occupying his former spot and Asik demoted to backup status. There was value for the Rockets in having both Howard and Asik on the roster; a pair of strong twin towers who specialized in defense and rebounding and — under the personal instruction of Hall of Famer and Houston legend Hakeem Olajuwon — were gradually learning to improve their offensive skill sets. 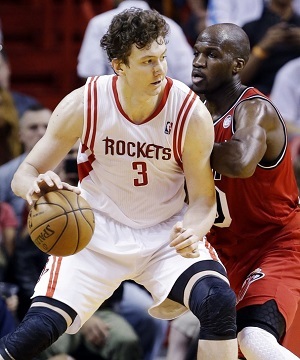 Asik appeared to be settling into his new role in Houston and may have even looking forward to Year 2 with Howard. But then LeBron James and Carmelo Anthony decided to opt out of their respective contracts this week, and the Rockets might be able to scrounge up enough money to afford one of those superstars, so … on Wednesday night the team agreed to trade Asik and his $8.3 million salary to the New Orleans Pelicans for a future draft pick. The cost-cutting move by the Rockets can’t be finalized until July due to the league rules. To clarify: I don’t think there’s anything wrong with any pro team trading a player or cutting a player who doesn’t fit what the franchise is trying to do. But at the same time, we can’t ask and expect athletes to be loyal to franchises when it’s obvious franchises will not be loyal to them. Asik doesn’t owe the Rockets his loyalty, just as LeBron doesn’t owe the Heat (or the Cavs), just as Melo doesn’t owe the Knicks. Because when the team can benefit from being “disloyal” to the athlete, they’ll do it in a heartbeat. Wednesday’s trade isn’t a bad move for Asik, either. He is going to a worse team — the Pelicans finished in last place in the NBA’s Southwest Division last season, while the Rockets made the playoffs — but to a team that can offer him more playing time. New Orleans is thin in the frontcourt (literally), with lanky rising star Anthony Davis established at power forward but otherwise an ample opening for Asik to start at center.